I thought it important to invite you to India's Largest Online Rewards Program. It’s really hard to find a decent online money program for Indians which works and is legit. I have been talking a lot about making money online, but in most of the cases you need to have a website or Blog. Here I’m talking about Youmint, an online web program which is more than just online money program for Indians. YouMint has over 60 Lakh Indian members and over 3 Lakh NRI members already and it's growing rapidly! By joining time itself you are eligible for coupons worth Rs 2500 which varies from discount coupons of Disney products, discount from travelguru, fast track glasses and more. +Send Free SMS to any mobile in India +Get Real time delivery reports +Your Mobile Number as Sender ID. No Ads! +Free Mobile Recharge! 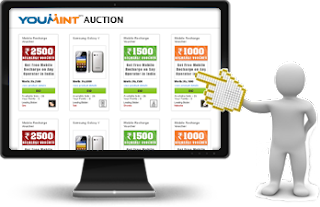 Reward Auction is an entertaining online auction which involves no real money and allows you to win exciting products every month. Products and services are placed on auction in a unique a process wherein the participant making maximum no. of Bid Wins!!! Every friend you invite generates earnings for you. Their invites also contribute to your earnings. For every NRI friend you refer, your account will be credited with RS 5. It could help you to pay your mobile bill. Start making money with Youmint now itself!!! Thanks for finally talking about > "Get Rs. 2500/- Worth of Coupons on Sign Up" < Liked it!